This week’s meeting of the Minneapolis Heritage Preservation Commission was unusually lively. On the agenda: A proposal by Alatus LLC to build a 40-story condo tower in the St. Anthony Falls Historic District, which limits the height and scale of development in the area. And the commission needed to make two decisions: whether to allow demolition of a funeral home and whether to permit construction of the tower. In a packed room, 13 people spoke out against the project and 10 spoke in favor of it (by our unofficial count). Most in favor praised its design and said that it would bring welcome density to the neighborhood. Some, including people already living in the neighborhood, said the area needed a better selection of housing options. One couple who sold their suburban house two years ago said they had fallen in love with the riverfront (after a interlude in Uptown they called a disaster) and were living in an apartment along the river but wanted to buy in the Alatus building. Those opposed were passionate in their conviction. 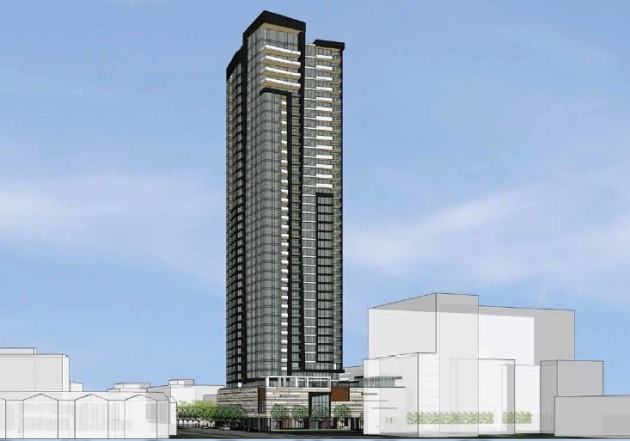 Several said that, while the tower was attractive, it’s being proposed for the wrong site and would be better suited downtown. “It belongs on the other side of the river,” said one. Some, like the HPC commissioners themselves, focused on the precedent that would be set by ignoring the guidelines established in the St. Anthony Falls Historic District. “These guidelines are the only thing that stand between us and oblivion,” one neighbor said. After two deadlocked votes on whether to allow demolition of the funeral home, a third vote in favor of allowing demolition passed after Commissioner Constance Vork included a requirement that for six months the developer should use media and other means of finding someone willing to move and reuse the building. After a brief discussion, and a separate motion, the request for a certificate of appropriateness to build the tower was denied six to two. The HPC’s decision can, and has several times in the past, be appealed by the developer to the City Council. After the meeting, Alatus principal Bob Lux said that he’s considering his options.